A long time ago, in a galaxy far, far away… that’s pretty much the sum total of what I knew about Star Wars prior to seeing the latest installment, The Force Awakens. I did see one of the original movies when they were re-released in 1997, but I have no recollection of the movie itself, so I can conclude it didn’t really interest me. The only thing I remember is sitting in the cinema and after about half an hour, my mother declaring “I’ve already seen this!” But I digress. The point is, I’m not a Star Wars fan. 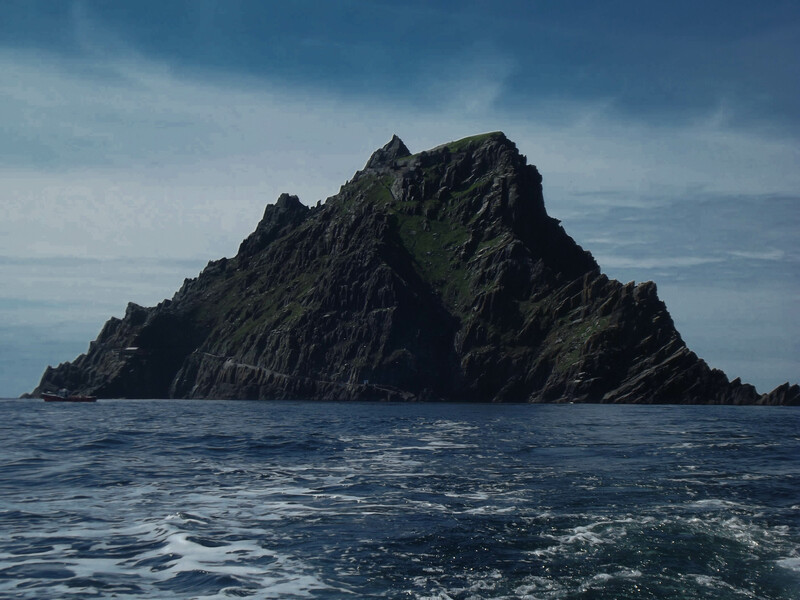 I was, however, very interested in seeing the new movie as some scenes were shot on one of my favourite places in Ireland: Skellig Michael in County Kerry. 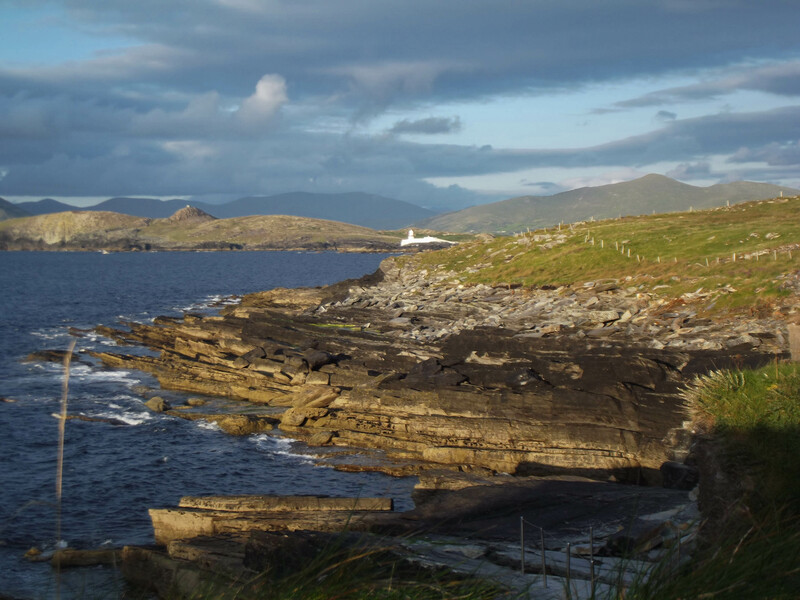 The filming was widely publicised in Ireland and some people were concerned about the film crew potentially damaging the UNESCO World Heritage Site, or disturbing the birds that call the island home. Thankfully, an expert review of the island found that the filming had “no adverse impact on seabirds, their habitats or other biodiversity on the island“. 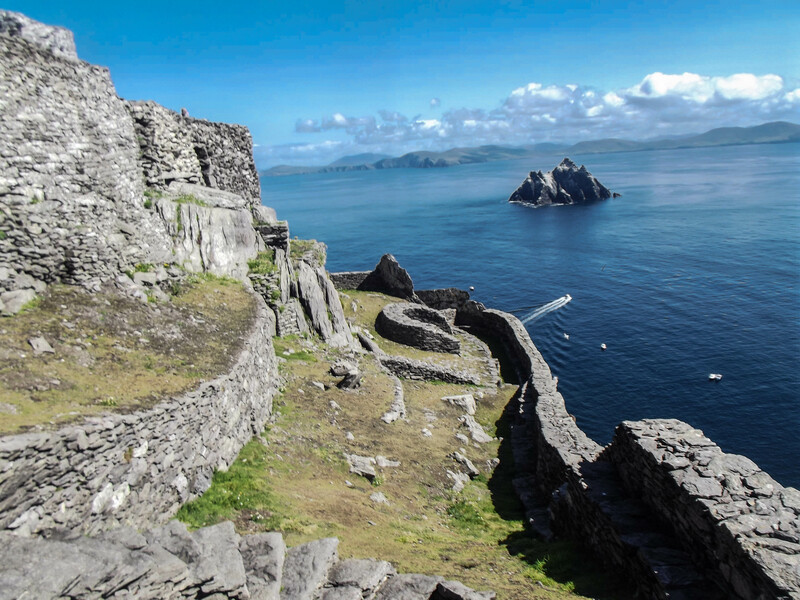 There is no doubt that the remote, uninhabited island off the southwest coast of Ireland will receive a tourism boost from the filming, but it’s not just for Star Wars fans. The island has something mystical about it. It’s a place that has to be seen to be believed. 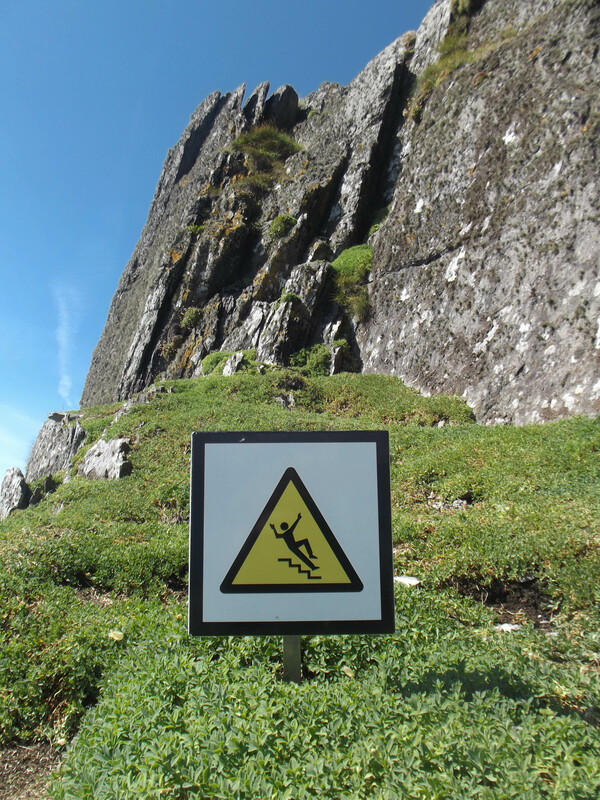 The island came to my attention in 2014, when I visited as a result of a geocaching trip to Kerry. 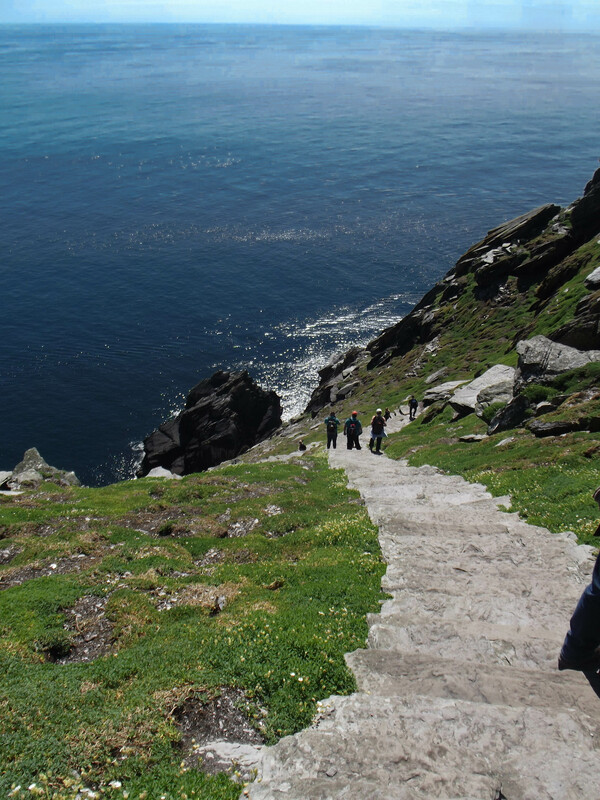 A small group of us went over to explore Skellig Michael on a beautiful summer day in August, just weeks after filming for the first of the sequel trilogy had taken place. T-Shirts emblazoned with ‘Skellig Wars’ were already being sold in the gift shop on the mainland in Portmagee. Last weekend, I went to see the film and I thoroughly enjoyed it: I might just be a convert! 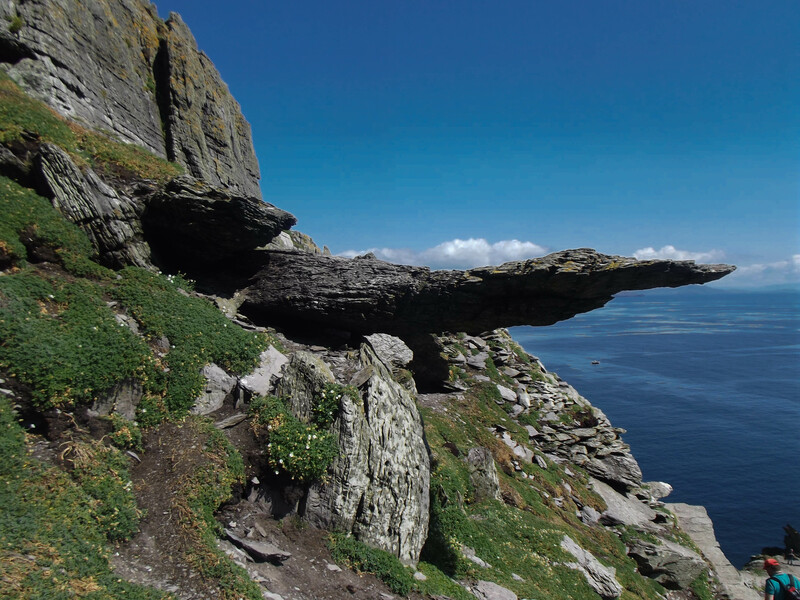 Undoubtedly, the most exciting part for me was seeing Skellig Michael in all its glory, and from what I could see, nothing of the landscape was changed. The island itself is exactly as it appears in the film: remote, wild and like nothing else you’ve ever seen. 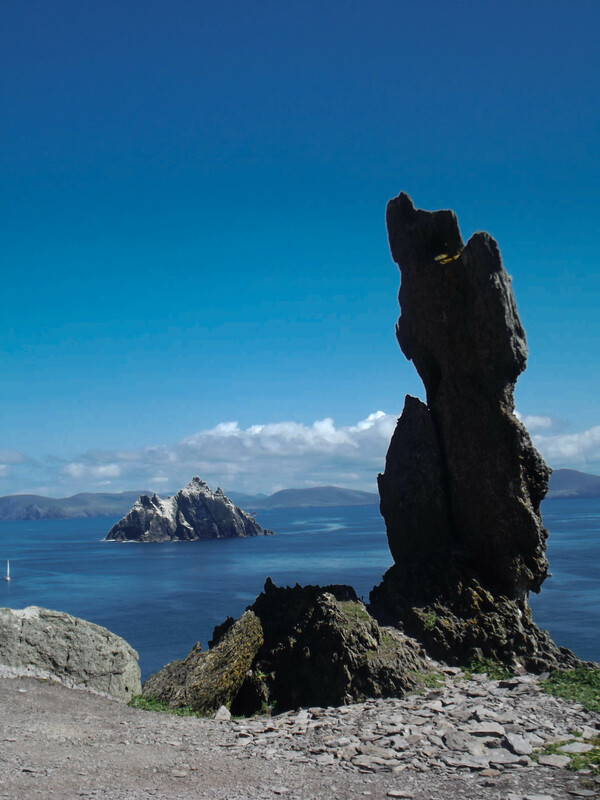 The Skellig Islands – Skellig Michael and Little Skellig – are located 11.6 kilometres (7.2 miles) off the coast of the Iveragh Peninsula in County Kerry. Boat trips to the island depart from Portmagee, Ballinskelligs, Valentia, Renard and Caherdaniel, but Portmagee is the main departure point. 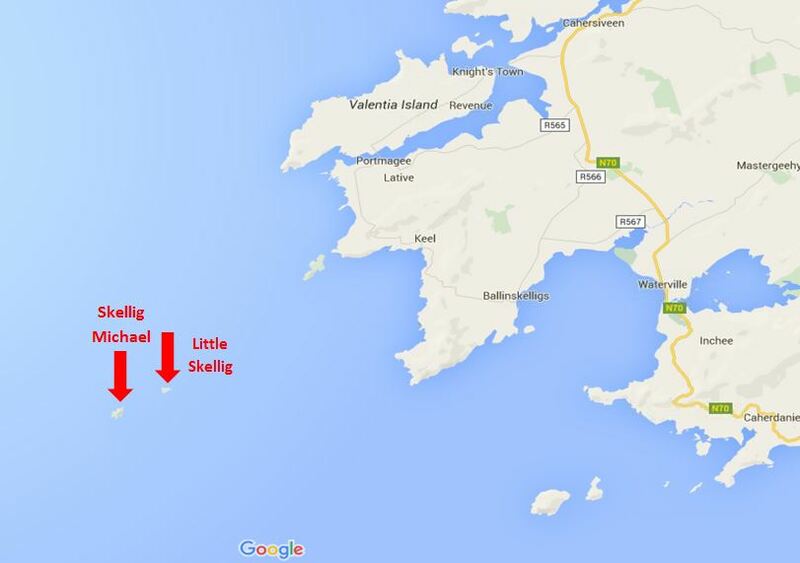 There are a few different boatmen offering trips but we went with Des Lavelle of Lavelle’s Skellig Trips. As I mentioned, I went in August 2014 and the cost at that time was €50 per person. You can find contact details for Des here and I highly recommend a trip to the islands with him. It takes minimum 40 – 60 minutes to get to the island and you need a strong stomach: weather conditions were optimal the day we went but it was still quite choppy. Once you arrive, you have plenty of time to explore the parts of the island that are accessible. 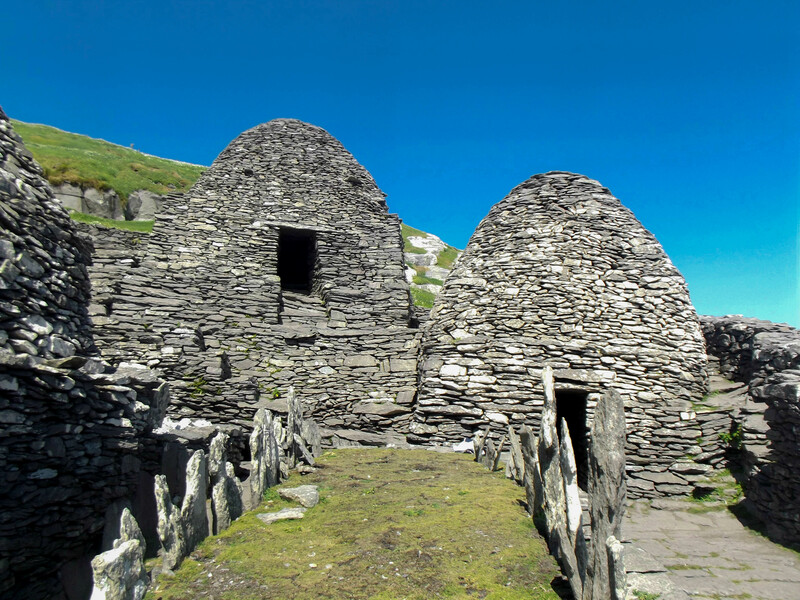 Skellig Michael became the site of a monastic settlement in the 6th Century. The monks would descend the 600 steps of the island every morning to fish in the waters, before returning up to their beehive cells, 160 metres above sea level, to pray, study and tend to the gardens. There are three sets of steps up to the monastery, but only the South Steps are accessible to the public. 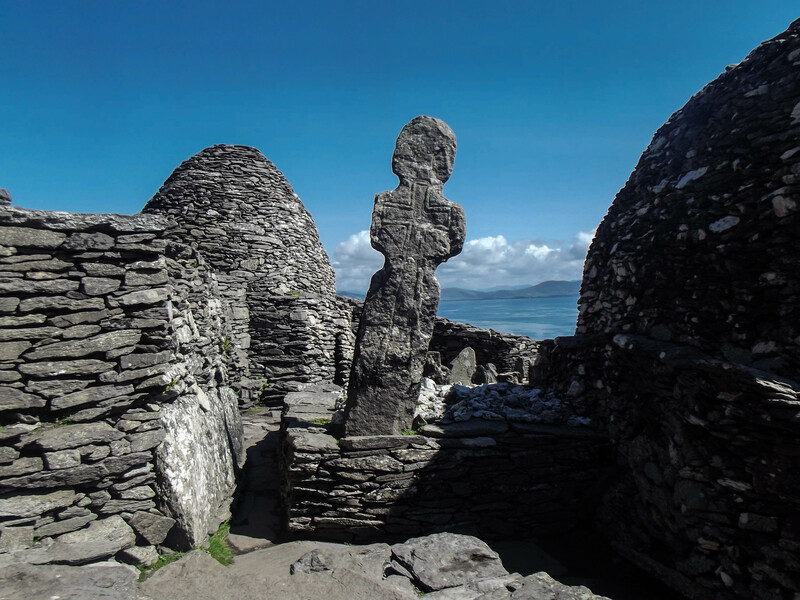 It is hard to imagine that the steps and the beehive cells, carefully constructed to ensure no rainwater would get through the stone, were built by monks with just the stone that existed on the island available to them. We were met by a Guide when we disembarked, who gave us a rundown of the rules while visiting the island. 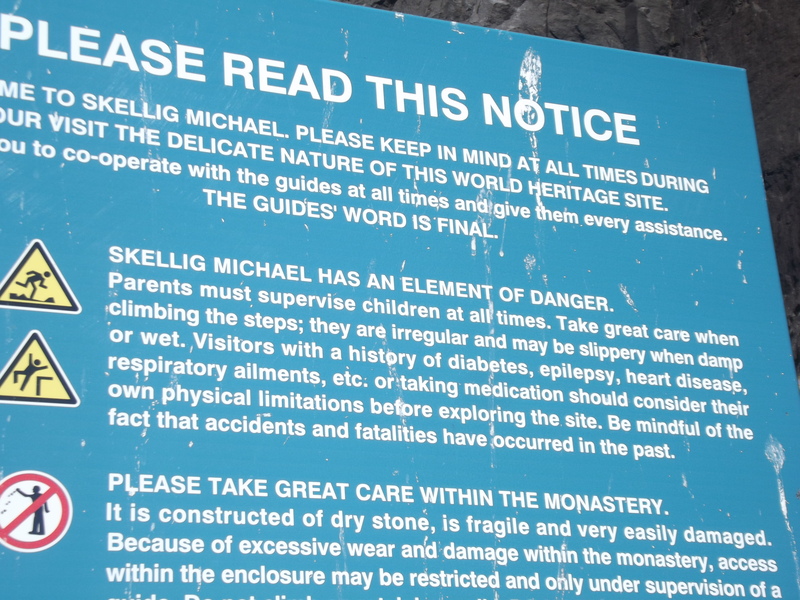 The steps and the entire monastic settlement is made of dry stone and is therefore very delicate and the utmost care must be taken not to disturb any stones. Depending on what time of year you visit, you will also be informed not to disturb any of the nesting birds on the island. Puffin season is the summer months, where hundreds can be seen along the walk up to the monastery, but the colourful birds have all left by August. The steps can be very slippery when wet and they are extremely steep. The warning sign near the boat dock warns that accidents and fatalities have occurred there so it’s definitely not for the fainthearted. There are no toilets on the island and you will be off the mainland for 5 or 6 hours. It’s essential to bring your own food and drinks and to ideally keep them in a backpack, so your hands are free as you walk up and down – there are no hand railings! The lack of something to steady yourself wasn’t too bad on the way up, but it was quite scary on the way back down. Slow and steady is the name of the game. We were met by a second Guide at the monastery, who gave a talk about the history of the island. You can wander around the beehive cells and even inside: not the greatest idea if you’re claustrophobic but it’s fascinating to see how they’re made: circular on the outside but rectangular on the inside. On the boat ride back, Des brought us around Little Skellig, which is closed to the public and is home to Ireland’s largest gannet colony with nearly 30,000 pairs. Des cut the engine when we were close to the island and the noise of almost 60,000 birds was unreal. 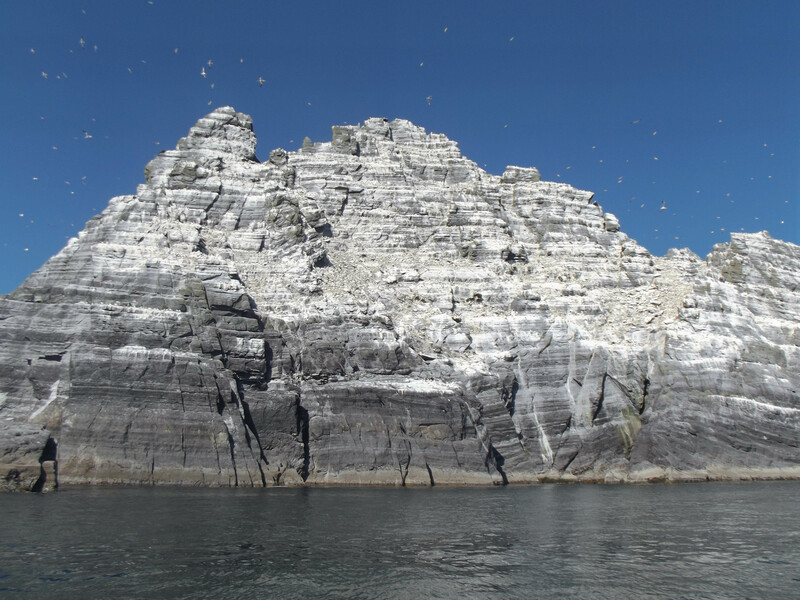 The island looks snow-topped from afar, but really, the white colouring is the result of the gannets doing their business there over hundreds of years! The whole experience was very memorable and I plan to go back again this year, hopefully during the summer months so I can see the puffins nesting. The best case scenario is a day like we had on the island with sunshine and clear blue skies but the weather is not always as kind, so wind and rainproof gear should be brought along, just in case. 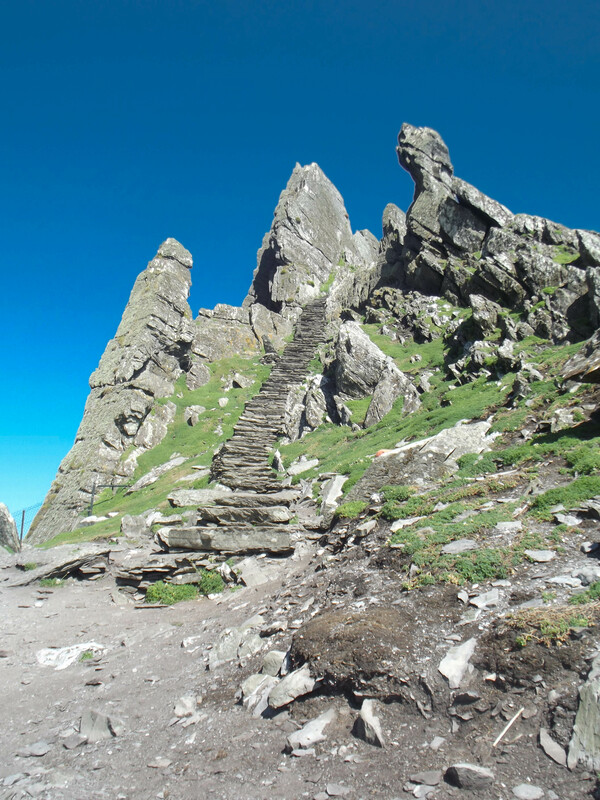 A trip to Skellig Michael is a must, not just for Star Wars fans. Its remote location has kept it in excellent condition for a site so old and the great efforts of the Office of Public Works to preserve the site will hopefully ensure its current state for many years to come. If you’re looking for a place to stay, I highly recommend the Ocean Bliss B&B in Cahirciveen (a 25 minute drive to Portmagee, where the boat tours depart). Michael is the aptly-named host and he is by far the nicest bed & breakfast owner I’ve ever encountered. The rooms are reasonably priced and very comfortable, and the views on the deck are stunning. I also had the best breakfast I’ve ever had in a B&B at Ocean Bliss: scrambled eggs and smoked salmon. A full Irish breakfast or pancakes were other options I would have tasted had I stayed longer than one night. Fingers crossed he has room for us when we visit Kerry again in the summer! 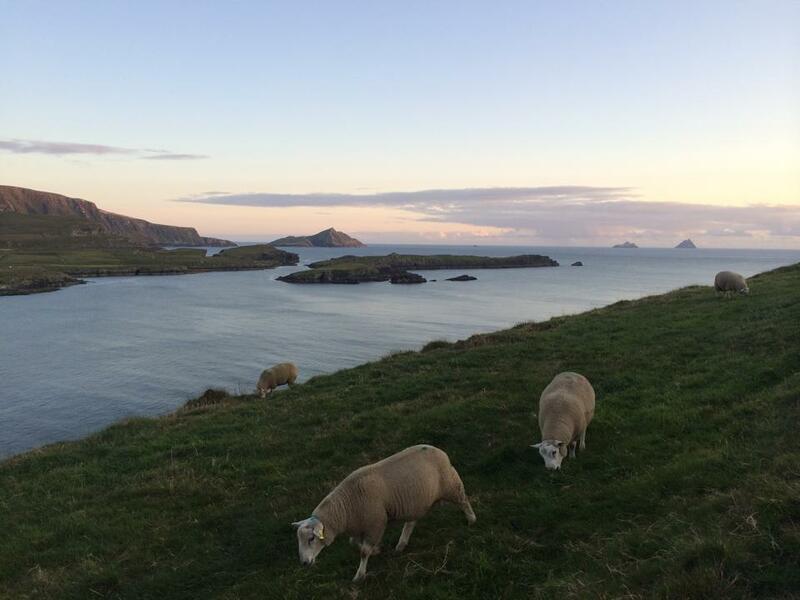 If you’re in the area, you should definitely visit Valentia Island. 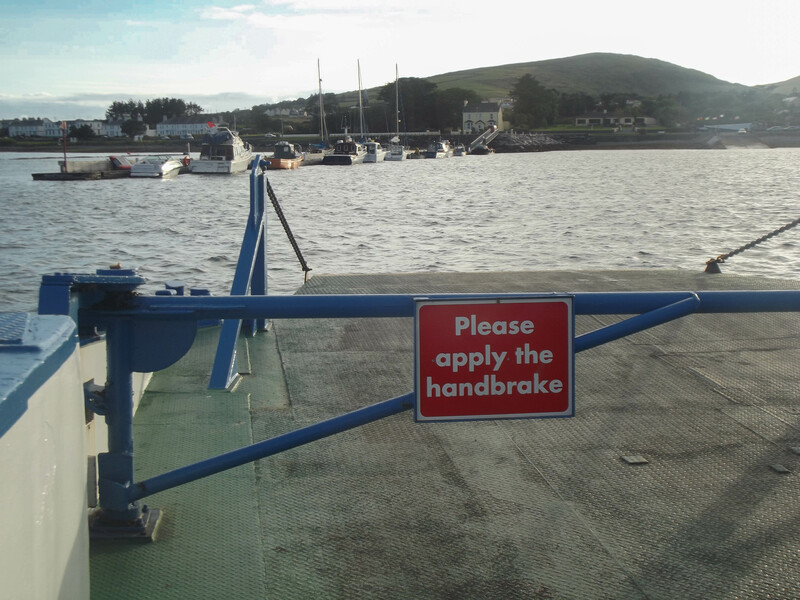 It’s connected to the mainland by a land bridge at Portmagee or by a 5 minute car ferry journey (running from April to October for a nominal fee) from Renard Point, Cahirciveen. I went out on the ferry and back by the bridge, to experience both. If you don’t have much time on Valentia, there are two must-see places. The Tetrapod Trackway has imprinted footprints dating from between 350 and 370 million years ago, of one of the first animals to ever walk on land: the tetrapod, small and lizard-like in appearance. Park at N 51° 55.770 W 010° 20.749 , and walk down the fenced path where you can see the Trackway and read the information board there. 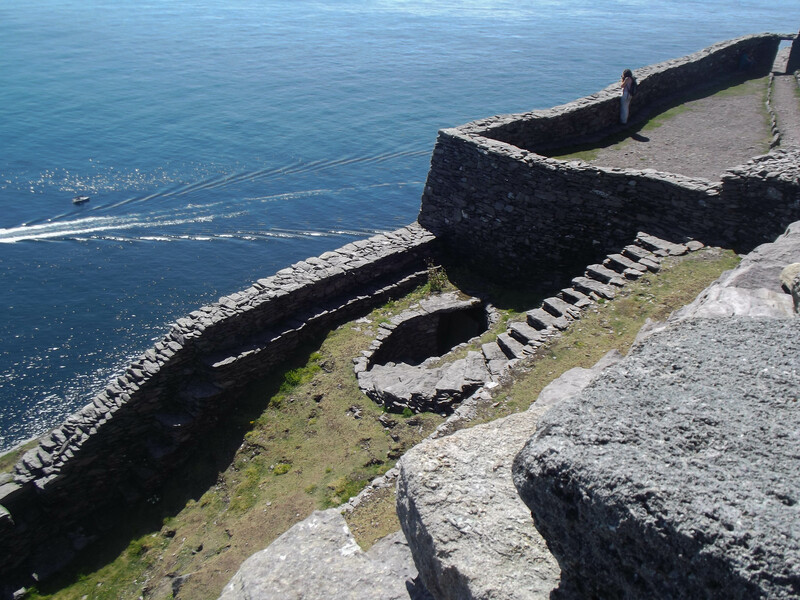 Your second stop should be at the viewing point near Bray Head. Drive to N 51° 53.515 W 010° 23.832 and enjoy the magnificent views. 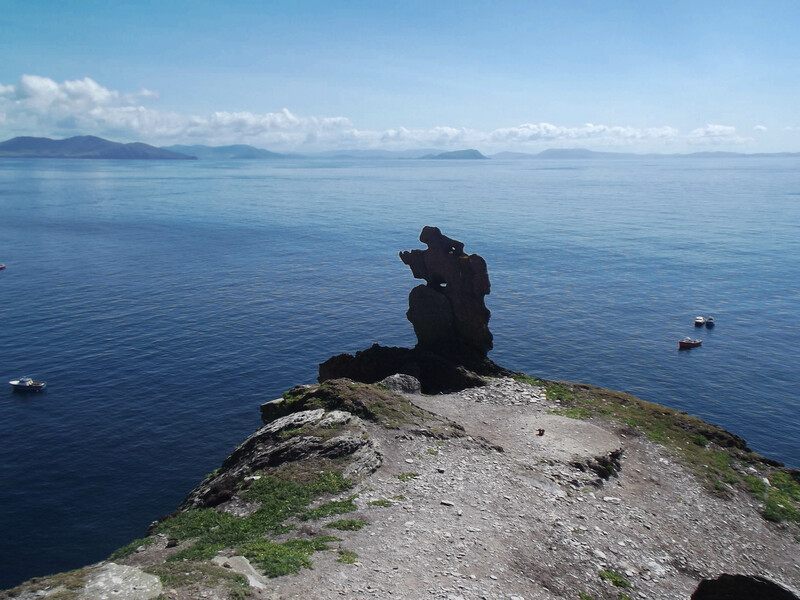 You can see the Skellig Islands in the distance. If you’re happy enough to drive back to the bridge in the dark on the narrow country roads, this spot is the perfect place to watch the sunset over the Atlantic Ocean. Happy travels and may the force be with you. Note to Star Wars fans. The route taken by Rey ascending the island is not physically possible on the real island. This is due to the cut of the film. Rey passed through the beehive village before ascending further in order to meet with Luke at the end of the film. This cannot be possible as the village is just below the summit at the northeast end of the island. It is likely that the actual meeting point was somewhere southwest of the saddle. As for the 2014 trip. The weather could not have been more perfect and I was happy to have hosted that event in conjunction with the annual geocachers camping event.